The next generation of Mortgage Lenders requires an unprecedented level of checks and balances. UHS America is your proactive partner for originating quality loans while delivering exceptional service. The residential mortgage quality control service includes a full and complete Post-Closing Audit and re-underwrite of each loan file. Our highly experienced auditors conduct a comprehensive review that complies with quality control standards as set forth by Fannie Mae, Freddie Mac, FHA, VA, and USDA. In addition to this, UHS America will enhance the due diligence requirements to include any special documentation or requests that are unique to your business needs. Random Selection - With years of experience in selecting loans for clients, our stratified random selection engine allows clients to practically select any parameters they desire. Our engine can be customized and tuned to meet your needs and can be changed month to month, depending on circumstances. 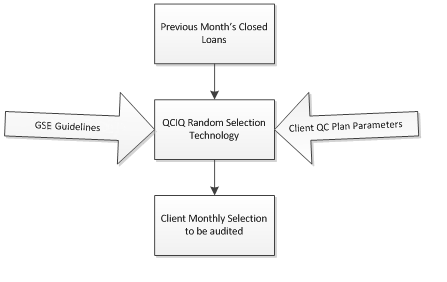 Whether you need to select 10% of Conventional loans each month or select 10% of a new Loan Officer or a new Underwriter’s loans for a single month, UHS America QCIQ’s selection engine is your answer. Our process also allows the Client to perform the random selections internally based on GSE and/or internal QC Criteria. UHS America audits include a re-evaluation of all credit documents; pulling new credit reports, appraisal field and desk reviews; thorough analysis of the underwriting decision, and supporting documentation to include a complete audit of all credit and closing documents including a re-calculation of income, assets, TRID requirement along with a complete compliance review. Reverification of Employment and Assets - The final UHS America Management Reports Package includes Trending reports and an Executive Summary, which will provide you with all the standardization you need to properly evaluate your loan origination process. Our objective is to deliver the report of our findings to you within 60 days from the date we receive your loan files. Interactive Rebuttal – We have a solution that will improve the client experience during the cumbersome rebuttal process. With our new technology enhancements, you can now control your exceptions by directly logging in to QCIQ, viewing all historical audit groups, mitigating exceptions and generating reports. Update and finalize your reports by the touch of a button. The Interactive Rebuttal Process streamlines the rebuttal process by allowing clients to respond and mitigate loan exceptions internally without the back and forth hassle that can interrupt reporting timelines. After we conduct a thorough audit review of each loan group, we will issue the initial results to the user’s portal. In turn, you will record your responses directly to QCIQ reducing the manual process of inputting responses on to a spreadsheet, gathering missing documents and then uploading the missing documents for an additional review. Our senior management experts will continue to provide you the best-in-class support to validate or discuss findings. Compliance due diligence review, including the TILA-RESPA Integrated Disclosure (TRID) rule.